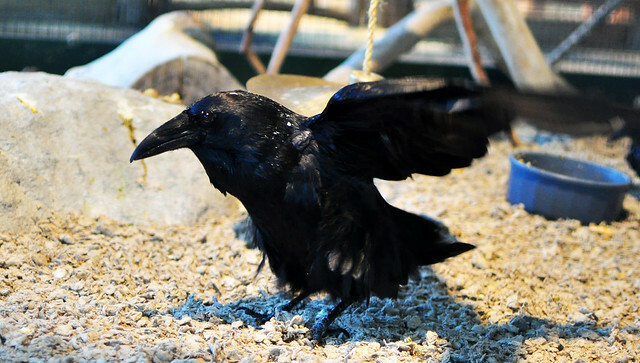 raven, a photo by hep on Flickr. 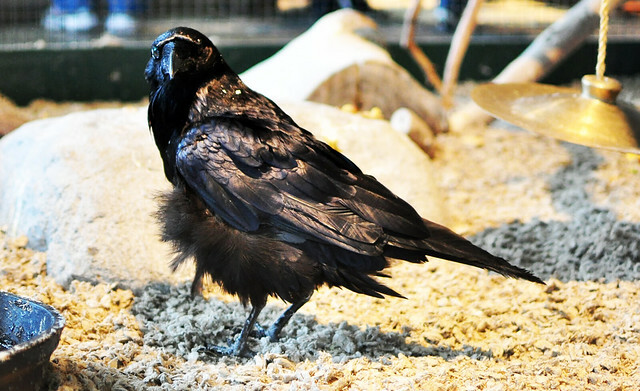 this my friends, is a blind raven who lives at the randall museum in san francisco, one of the best kept (FREE!!) secrets of the city. the randall museum houses a lot of animals who can no longer live in the wild due to being tamed by humans or injuries they sustained. 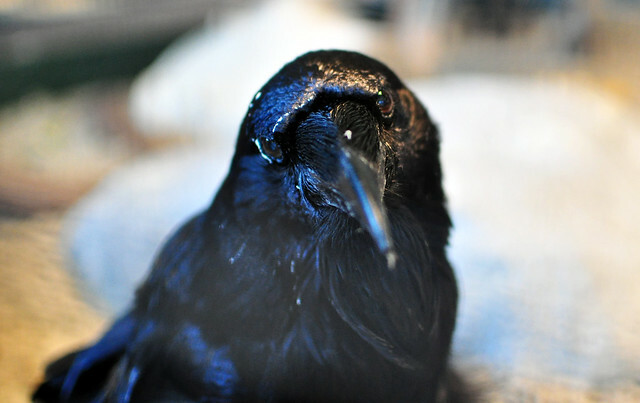 this raven, besides being blind, is also missing several of his wing flight feathers. this is his partner raven, who has only one wing. he isn't very steady on his feet because one of his feet is also partially paralyzed. sometimes he loses balance and falls over, which is heartbreaking, watching him try to get up. but he has adapted very well, as most corvids are wicked smart, and he is able to not only hobble around, but to counter balance his one wing with his beak to push himself back up in the times that he does topple over. however, the blind raven is my bff. he follows me around the pen and tries to get out to inspect me. 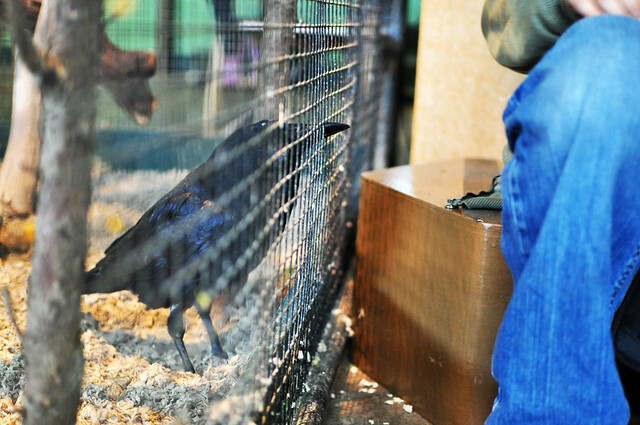 when i would move to the other side of the cage he would carefully make his way over no matter where i went. where, again, he would methodically attempt to get through the bars, after which he would toss the bedding on the floor around and test if perhaps there was a way through that way. what can i say, animals love me. it must be my animal magnetism right? hehe! as with most people, i adore corvids. 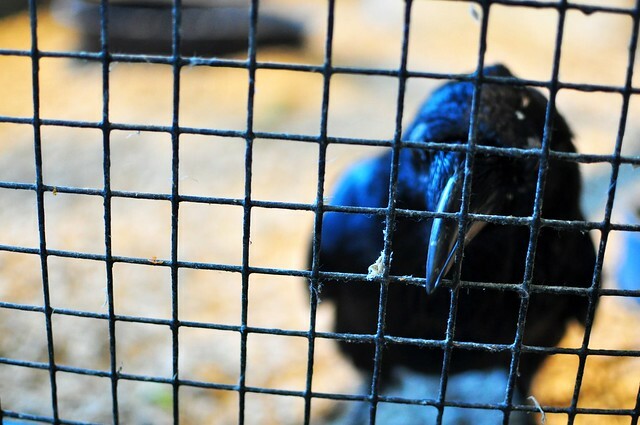 i enjoy visiting my captive corvid friends every few months at the museum. come fall when i get more free time i plan on adding an animal docent shift every few days to my volunteer schedule. if you ever make it to sf, i highly recommend you make the randall museum a stop on your list. 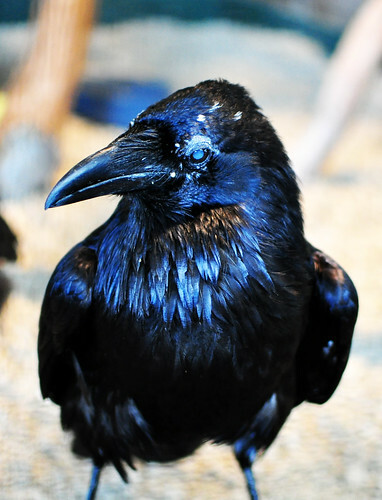 if you would like to see more images of the ravens, or of the crows, hawks, owls, and other birds the museum houses, head on over to my randall museum corvid, raptor, and owl set. <3! I love these pics! We have a pair of ravens nesting near our place and I spend way too much time watching them. Mr. raven and I sem to have come to some sort of understanding. He lets me get quite close, and seems to be interested in watching me too. They're fascinating birds! they really are interested in us! we have a ton of ravens in the diff places we visit that we check out. a lot of them also check us out just as much. we had this one pair of ravens, recognizable because one of them was missing a particular flight feather, that always follow us when we ride bikes in their area. they just flit from tree to tree with us (they can take shortcuts because they know where we are going, the little jerks!) and seem really interested in whatever we do! i also can mimic a lot of raven calls close enough to confuse them or at least interest them a bit. my favorite is the beak clacking noise they make, it's SO awesome because they change the rhythm and cadence! it sounds a little like castanets! Cool! Our ravens like to mimic Canada geese (there are a ton of geese in our area). i will take you guys there! Ravens are really amazing birds. Thanks for sharing. I love them. Birds and photos. i love ravens. they are so cool! yeah they are some of my favorite birds. i always get torn between the raptors, corvids, and owls. I LOVE THEM ALL! At my mom's house we had a little owl. He used to sit on the branch of the dead tree in our yard that sat closest to the porch. I would go sit on the porch to smoke and we'd stare at each other. He was precious! Nice. Beautiful photography, as always. Oh, I loved this! Your photography is so beautiful. i had good models. 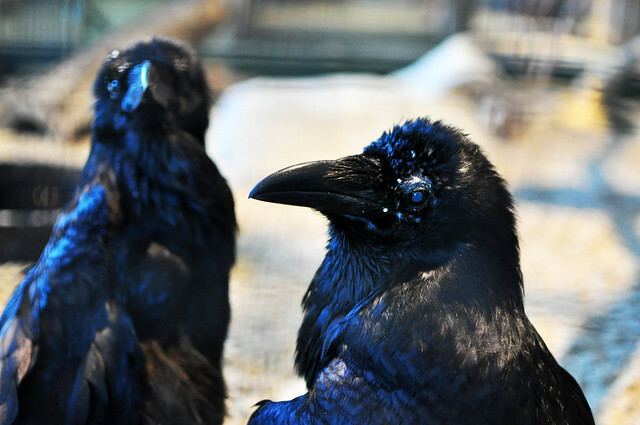 ravens are total hams! I love the textures. They're such gorgeous things. My gf's flew off and moved into the tree across the street. It was spending most of it's time chillin' with some sparrows, but I think it realized that it wasn't quite the right size fit. But now 'luna' kicks it above the REDACTED hangout, and bcaws whenever me and my dog roll through. It gives me some roots.